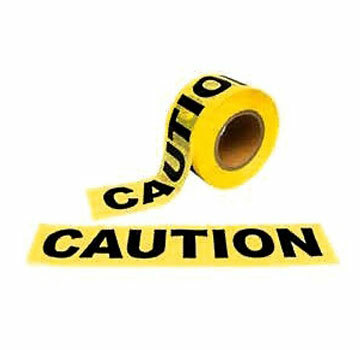 PRODUCT: CAUTION TAPE, 3" WIDE x 1000' LONG x 3 MIL THICK, HEAVY-DUTY GRADE. PRICE/ROLL. Super Sale. * Made from tough polyethylene. (DON'T CONFUSE WITH CHEAPER 2 MIL AND 1.5 MILS TAPE). * Bright Yellow Tape Repeats CAUTION continuously in black ink. * Meets OSHA 1910.144 specifications for marking physical hazards. Recognized worldwide as the tape used to identify dangers. Used by many industries including the following industries: Law Enforcement, Construction, Painting, Safety, Event Management, Mining, Custodial, Hardware, and Utility. * Warn of hazards and prevent accidents. * Highly visible heavy duty yellow tape. * Can be tied, stapled, or nailed in place.